Call history on the IP phone — featuring incoming calls on busy set! IPCallLog introduces the possibility to display a complete call log on the IP phone. It uses the XML interface of the IP phone family (8028, 8038, 8068 und My Softphone) to show number, name and time and date of past calls on the display. Listed are missed calls and, otherwise not possible, all outgoing and accepted calls and even missed calls that happened while the line was busy. The call log keeps more than 200 calls and every entry can be called and even saved to short dial slots from within the list view. sys-groupcall informs you via pop-up about incoming calls within your pickup group. You can pick up calls with just one button press. A settings page allows every user to decide for himself whether he wants to receive popups for every incoming call, only for external call or no pop-ups at all. sys-LDAP introduces the possibility to browse your companies LDAP directory directly from your desk phone, without time consuming configuration of the telephone systems short dial list. This means less administrative work and no outdated data. Another big advantage is that you can search not only by name but also by department or personal number, enabling faster and more efficient searches. Since the application runs on your IP Touch phone, it is also available if your computer is shut down. As is usual at systel, the fields of the search forms can be adapted to your needs. Any field available in your LDAP structure can be used as search key. sys-book introduces the possiblity to maintain your personal phone book on your IP Touch phone. New entries can be created and modified through the application menu or directly out of active calls. Every entry has up to three phone number slots: office, private and mobile. If required, these slots can be adapted to your needs. All contact data is stored on the telephone system server. This way, if your device has to be replaced, your old sys-book is instantly available on the new device. Actively screen and open doors from your IP phone – with live streams! sys-cam introduces the possibility to view the live stream of any webcam connected to your LAN on the display of your desk phone. It uses the XML interface of the IP phone family (IP Touch 4068, 8068 and My IC Phone 8082) to display a control panel and door terminal information. Neither the number nor the type of the registered door terminals is limited. The application automatically starts on door bells and motion sensors. Alternatively, the camera stream can be displayed manually. The name of the currently shown terminal is displayed next to the live view. 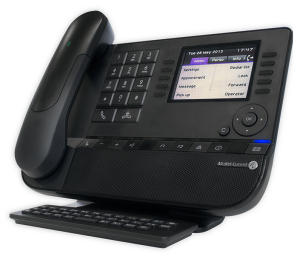 The advantage of this solution: The IP phone is, unlike the PC, always on and thus permanently reachable. sys-time introduces the possibility to use Alcatel IP Touch phones (4028, 4038, 4068) to subscribe and unsubsribe to time tracking systems, comparable to traditional time tracking terminals. Dates are assigned to employees by device number or by a personnel number (entered on the phone display). Even the use of Active Directory (LDAP) names for identification is possbile. The application writes the subscription data into formated files, which can be automatically imported by most established time tracking systems such as MBI+ / GFOS or SAP. Like this, sys-time can help you save hardware and administration costs.